We’ve kicked off our winter season. The snow birds are slowly returning and the Bonita Springs real estate sales are closing for the over-winter residents who are making Bonita Springs their permanent home. Would you believe that 93% of our sales are priced under $600,000!? Amazing numbers. 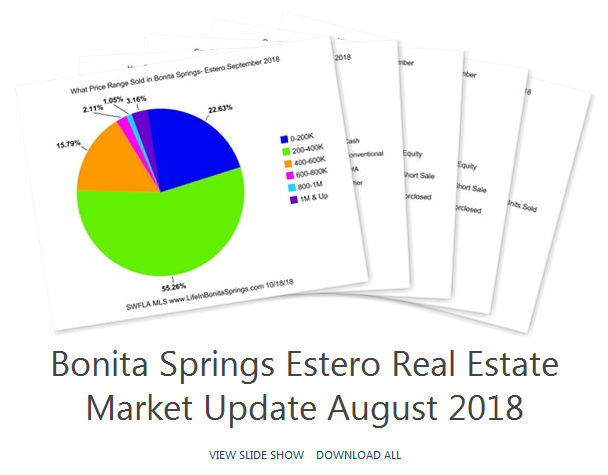 The majority of those Bonita Springs home sales occurred in the $200,000-400,000 price range. Buyers are funding their purchases with cash (50%) and conventional financing (40%). We have few FHA and VA sales in the area due to loan limits and that we are not in close proximity to any military base. There are a variety of owner financing, 1031 Exchanges and non-conventional loans such as Physician Loans or Hard Money Loans. The Bonita Springs area is chugging along. Buyers and tenants will be in the area over winter. If you are thinking of listing your home to sell it next year be advised to get it active on the MLS toward the end of January for maximum exposure. Many home seller wait too late into spring to find a listing agent and miss the tourist season of buyers. If you have questions about the Bonita Springs or Estero Florida real estate market call or text Chris at 239-273-7430.